Once again, OSHKOSH is fast approaching and we hope a greater number of you than ever before will be packing your bags for the trip. We hope that a bunch of you will be loading them into tandem wing canard aircraft rather than "spam cans" or cars. 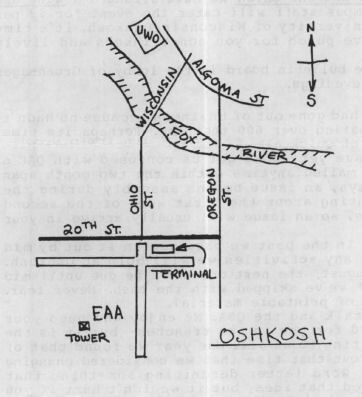 The Third Annual QBA Oshkosh Forum will be held Sunday night in Forum Tent #1 starting at 8 pm. This meeting will be open for discussion of virtually any subject, gripe, tip, suggestion or etc. If anyone has a burning urge to present something for up to ten minutes, write or find me at Oshkosh and I'll block out some time for you. Tuesday night at 7 pm in the Algoma room of the Reeve Student Union we have arranged a wine and cheese party for QBA members and their guests. The campus staff will cater the event for $3 per person or $5 per couple. If you've never been to the University of Wisconsin/Oshkosh, it's time you did. See the map below for directions. We'll have punch for you non-drinkers and lively discussions all around. A sign-in roster for QBA members will be posted on the bulletin board in the lobby of Gruenhagen Hall so that we can locate and visit each other in the evenings. I recently got a letter from a member wondering if we had gone out of business because he hadn't received the newsletter that he expected. I had just mailed over 600 that day. Perhaps it's time to pass on a little background info on the publishing of Quicktalk. In over two years, we have not been late with an issue yet - don't get us confused with QAC's newsletter which is regularly late. Quicktalk may be mailed anytime within the two-month span indicated on the cover page. Generally, but not always, an issue begins assembly during the first month of its period and is delivered for printing about the first week of the second period month. Printing and mail out take about 7-10 days, so an issue will usually arrive in your mailbox about the middle of the second month. The July/August issue gets in the way of Oshkosh, so in the past we have gotten it out by mid-July, especially since it has last minute info about any activities we will hold at Oshkosh. Herein lies a problem. If you get an issue prior to August, the next one won't be due until mid-October, leaving a 3-month period for you to wonder if we've skipped with the cash. Never fear. We'll call this to a halt only if we start running out of printable material. On that subject, always remember that YOU are Quicktalk and the QBA. We enjoy and need your applause from time to time - it keeps us working hard for you in the trenches - but it is the shared knowledge that keeps this publication interesting to us all. One year we found that of over 600 members, only 80 had written to us. It was about that time that we considered changing the cost of membership to $8.00 per year PLUS a 100 work letter describing something that interests you about the Quickie experience. We dropped that idea, but it wouldn't hurt if you guys and gals took that on as a voluntary obligation to your fellow members. Anything you send us is subject to publication. We often assist your spelling and syntax to make you look good, but we try our darndest to keep your meaning the same. In some cases we'll write or call an author to clarify changes, but this can be cost or time prohibitive. A lot of time is spent typing material and then cutting it and pasting it into the space available. If your article or tip won't fit an issue, you may not see it when you expect, but it usually appears sooner or later. If your contribution confuses this gray ol' head, it may get set aside until it is better understood. Repeated items or those that may be controversial or, in our opinion, obviously unsafe may not see print. Photos - we love 'em. However, to fit many in we have to cut and fit (much like installing a fuel tank), therefore don't send any in that you expect to be returned intact. To fit around my life, QBA business is generally held for Sundays. If your letter happens to arrive on Saturday, you may get a lightning response compared to what happens if it arrives Monday. Recent news from Quickie Aircraft Co. is that their aircraft did very well in the most recent CAFE 400 race. First place went to a modified Vari-EZ, which was followed close behind by the company Q-200. Third place went to Scott Swing in his Q-2 with the new heads. Sheehan's Q-200 flew with the new brake system which allows a much narrower wheel pant. I was disappointed to hear that the Dragonfly did not compete this year. You can order a PDF or printed copy of QuickTalk #16 by using the Q-talk Back Issue Order Page.